2 gable ends at 20 1/4" x 47 1/4"
1 top at 41" x 21"
1 bottom at 39 1/2" x 20"
1 back - 1/4" plywood - 40" x 45 1/2"
4 drawer fronts 9 3/8" x 39"
Cabinet plywood is considered G2S (good 2 sides), but one side is usually a bit better than the other. Always rip plywood with its best side facing up on a table saw and the best side facing down if you're using a circular saw. Use a sharp blade with the highest number of teeth for finishing work. We want to dado the back edge of the gables for the 1/4" back panel. For the dados cut in 1/4" deep the full thickness of the panel, that's 1/4 x 1/4. Either use a dado blade with the table saw (preferred) or use a router and jig. Assemble the top, bottom and back to the gables, as shown in the drawings. The Face Frame drawing shows which piece overlaps and which piece comes to the other. The hatched line shows the gables and top, behind the face. Refer to the Cutting List. These are exact sizes. The more accurate you are here the better the cabinet will turn out. Assemble the pieces with glue and nails. Turn the unit on its face and install the 1/4" plywood back. This will keep it square. On the gables, layout the position of the drawer slides. The slides come in matched pairs, with one for the drawer and one for the gable. They are marked LH and RH for left and right hand. The drawer mounts install on the bottom of the drawer with the roller at the back. We'll get to the drawers later. The gable mount slide is shown in this drawing. The end with the roller goes to the front and is flush with the outside of the face frame and rests on top of the rail. Screw these in position using #6 x 5/8" screws, 3 per slide. Make sure they are installed square across the gable. Since the gables are not flush with the stiles, pack out the gable with a 3/4" ripping to bring it out flush and install the drawer slide onto the strip. Put the cabinets away for now while we make up the drawers. The drawer boxes are made of 1/2" plywood. The sides are rabbeted to receive the front and backs, which are the same size. The outside width of the drawer must be 1" less than the opening between the stiles to allow for the drawer slides. You'll notice that one slide mounted on the drawer is flat on top and the other side has a rounded top which grabs the roller. There is a bit of adjustment with this design; it's better to be a bit too wide on the 1/2" gap rather than too tight. I'm talking a maximum of 1/16". At 1/2" on each side the drawer will slide nicely. The bottom is simply nailed and glued to the sides, back and front since the slide supports the bottom anyway. With plywood, glue and nails work well. 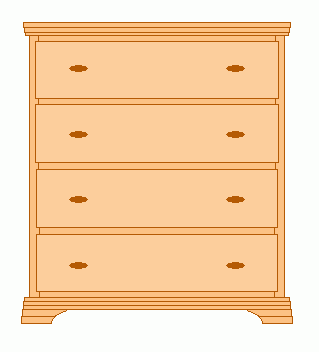 Don't fasten the drawer front onto the drawer box yet; wait for this step later. The height of the drawer, less the bottom, is about 3/4" less than the vertical opening to allow for clearance to get the drawer in place. At this point we will fasten the molding profiles around the top as shown on the elevation drawing. You can purchase molding for this purpose or use a router to make your own. I allowed for enough material in the Material List to make your own. Cut them to the approximate length adding extra for the miters. The profile is best done with the router under-mounted to a table. Rip the 3 1/2" base for the bottom unit, then router a profile on the top of it. The two front joints are again mitered. Fasten in place with glue and face nails. The toe kick is 2", rounded out in the front, as shown on the drawing. Cut the drawer fronts out of the 3/4" plywood. The edge grain can be covered with cherry wood edging tape or rip a profile out of the solid cherry stock. If going to router a profile on the drawer fronts be careful where you place your nails. We don't want to hit them with the router, since it is easier to router the edge after it is fastened to the front. For a choice of finish, I prefer a satin or semi-gloss clear Polyurethane product. Varathane is such a product. I use the Varathane Professional Clear Finish, which can accept a number of coats in a day, yet is oil based. If stain is your choice, it goes on before the final finish. I prefer a gelled stain applied with a lint free rag. Rub it on and wipe it off. Allow the stain to dry overnight before applying the finish. In my opinion, stay away from the stain and finish applications in one step. If the stain is not to your liking, after it dries, you can't change it easily. By pre-staining you have the option to sand it lightly to lighten the color or add a bit more to darken it. Apply at least two coats of the clear finish. When drilling through a finished frame, as when installing drawer pulls, hold a scrap block of plywood on the inside to prevent the drill from chipping the wood as it penetrates the frame. Enjoy your 4 drawer dresser.